I liked the look of the place: uncluttered, contemporary, with a white, beige and brown palette both subdued and warm. It wasn’t the hyper-masculine cliché that so many steakhouses are. But it didn’t mount an overly cute, overly self-conscious protest against that. I liked the service, too: friendly hostesses, prompt waiter, all performing in the same key, neither ceremonious nor matter-of-fact. With their bearings they communicated precisely what Parlor Steakhouse means to be. And that’s a steakhouse approachable enough to become a trusted standby for carnivores in its Upper East Side neighborhood and yet polished enough to draw steak lovers from beyond, at least those who haven’t already cast their lot with some other establishment’s porterhouse for two, who haven’t pledged their unwavering sirloin allegiance to a competitor that’s been cooking them much longer than this restaurant has. There’s a lot of competition out there, a lot of steak, much of it better than the little I sampled here. Neither the rib steak I ordered nor the filet that a companion got had the characteristically rich taste of prime beef, though the filet was expressly advertised on the menu as prime. It was tougher than a filet should be, and cooked slightly beyond my companion’s medium-rare request. Can overachieving condiments redeem underwhelming steaks? Not in my book. But the terrific béarnaise and creamy horseradish sauces that came with our steaks did suggest that whatever its flaws on the night I went, Parlor has some standards. Some ambitions. 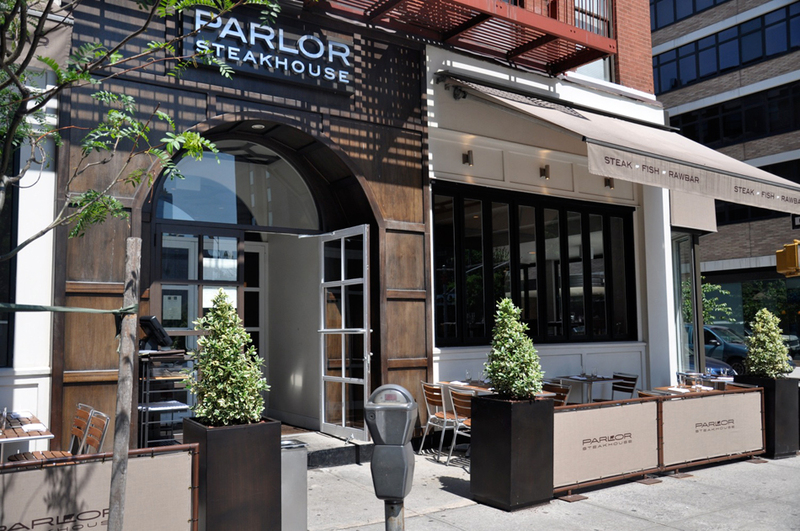 Parlor Steakhouse, 1600 Third Avenue (90th Street); (212) 423-5888. www.parlorsteakhouse.com. Dinner appetizers, $8 to $13; entrees, $15 to $39.50.